Seaside contemporary townhome on Nantucket Harbor—1/4 mile to Main Street with the beach in your backyard. Glossy quartz countertops. Luminous light fixtures. High-end stainless appliances. These are just a few of the 2017 upgrades that make this beachfront townhome exceptional. 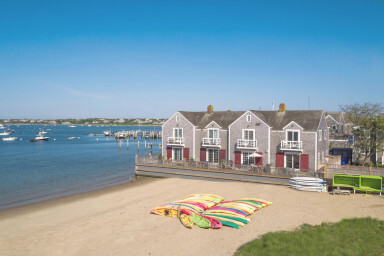 And then there's the location: right on the Kayak Beach at the edge of Nantucket Sound, just a few blocks from downtown's Main Street. Easily transition from a kayak excursion on the Sound to a night on the town. A minimalist dream home, Harborside Four features a crisp white design scheme awash in sunlight. Sliding glass doors in the living area let in views of the boat-studded harbor and open out to a dining deck with a shaded patio table for waterfront dinners—no reservation required. This immaculate townhome (second from the right in the images above) welcomes your group of four to an unforgettable getaway. Designed with intention, the living space at Harborside Four showcases the best in seaside contemporary style. From the flickering gas fireplace and wall-mounted flat screen TV to the sea-foam sofa and original art, every detail was carefully chosen to calm and inspire. After a day spent exploring Nantucket, crack open a new book, slide open the doors to the deck, and read to the sound of boats gently rocking in the harbor. At the heart of this contemporary townhome is the sleek, open-style kitchen with gleaming stainless appliances, including a gas range and French door fridge. Home chefs should plan to reserve at least one night to work their magic here. The Corian island is great for prepping ingredients—with space to spare for your wine glass, of course. Four barstools at the island let friends join in, too. The two upstairs bedroom suites each have their own private, attached bathrooms. The master bedroom feels like a room in a boutique hotel, with its cloud-like king bed, beamed ceiling, flat screen TV, glass-enclosed walk-in shower and breakfast balcony overlooking the harbor. The second bedroom has two plush twin beds and a tub/shower combination in its private bath. Other perks include a powder room just off the living space, a stacked washer & dryer, and complimentary Wi-Fi. And although no car is needed in this central location, one parking spot will be waiting for you.